Nose: clean, medium- intensity with aromas of red fruit (cherry and cranberry), cola and a slight aromas of wet pine. Palate: medium+ acidity, medium tannins with slightly chalky tannins, medium length, medium to medium+ alcohol, flavors of red cherry, candied rose petals, cola, cedar and a hint of warm spices. 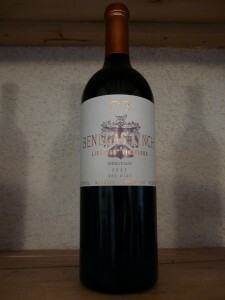 The wine is very young and will benefit from a minimum of 6 months of bottle age. The palate on the wine will improve as the tannins become more integrated, acidity soften slightly and the aroms/flavors integrated. As the wine has been open for 30 minutes, the palate is softening and the flavors are more pronounced. The wine is clearly showing terroir of the Split Rock Vineyard; I would like to see the wine blended with more clones/blocks from the Split Rock Vineyard. I would recommend that you cellar the wine for 12 months before opening your bottle(s). Appearance: Bright, clear medium- gold/yellow core to water-white rim. Palate: medium+ intensity; medium- acidity, medium+ alcohol, medium+ concentration, medium+ length; flavors of honey, mineral, cantaloupe, oak and a dried white grape finish. The wine has a noticable palate weight similar to a viognier but it could use some more acid to backup the ripe fruit flavors and heavy palate weight. The finish is not as crisp as I would prefer. Yesterday, I was supposed to be bottling the 2008 Rose (Sangiovese / Syrah), Santa Barbara and my 07 White Hawk Vineyard, Sangiovese. The bottling did not happen due to the wine being too cold — did not have enough time to warm up after being cold stablized in the cold room. The wine must be closer to room temperature to make sure the bottling machine fills the bottles with the correct volume of wine. In this case, the machine would have put in more than 750 ml / bottle due to the volume of the liquid being slightly smaller than when it is at room temperature. If the bottles were filled with cold wine, there is a chance that the corks would be forced out as the wine reached room temperature. I should be bottling the 2008 Rose, 2007 Dry Creek Syrah and the 2007 White Hawk Vineyard, Sangiovese, Santa Barbara next Wednesday. The labels have not been printed yet, so they will be put into “shiners” — no label and no foils. The 2008 Rose has turned out quite well. I am proud of how my experiment has turned out. The blend of Sangiovese bleed and Syrah bleed is very distinctive and very good. The chemistry on the Rose is: 4.0 grams/liter of sugar, total acidity is 5.5 grams/liter, 3.62 pH, 14.17% abv (will need to work on getting that down in the future). Jen is working on a name for the Rose, so we should be getting the labels printed soon. The Rose will be great with a bit of chill on it during the summer months! Wine tasting in Mendoza is quite a bit different than in the US. The concept of people randomly dropping by a winery to try the wine is a very new concept for Mendoza. Each winery typically has 24 hour on-premise security to deal with potential break-ins / theft. Given the level of security, it is necessary to contact the winery ahead of time (typically at least a day) to set up a time to visit. My wife, Jen, set up the touring for the day using a local tour service — Amphora Tours. I would highly recommend using Amphora tours as they know quite a few of the local wineries and which wineries make up a good tour. 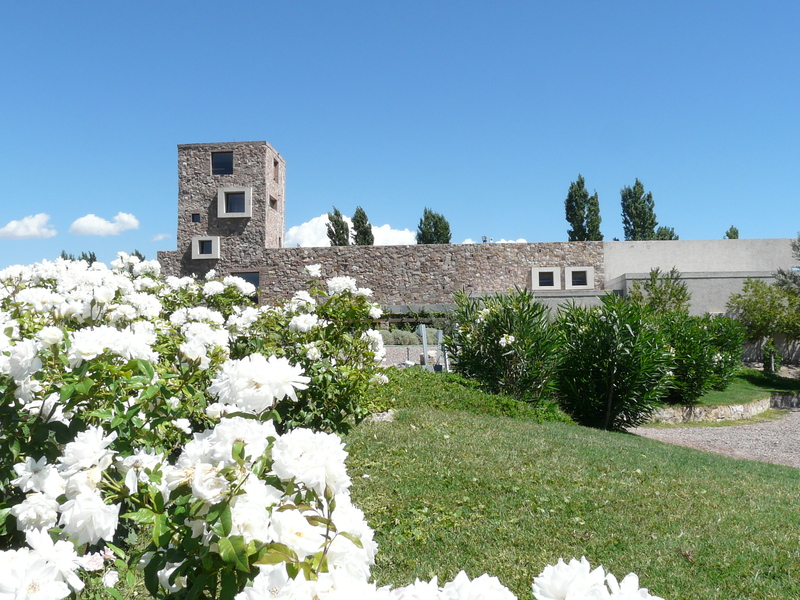 They provide a one day tour of the valley and a one day tour of the Uco Valley (higher elevation and further away from downtown Mendoza). Day 1 tour of the valley included four wineries: Clos De Chacras (a “boutique” bodega in the Chacras region of Mendoza), Renacer (a mid-sized bodega in the Lujan De Cuyo wine region), Ruca Malen (a large production bodega in the Lujan De Cuyo wine region ) and finished the day at Bodegas Benegas (in the Lujan De Cuyo wine region). 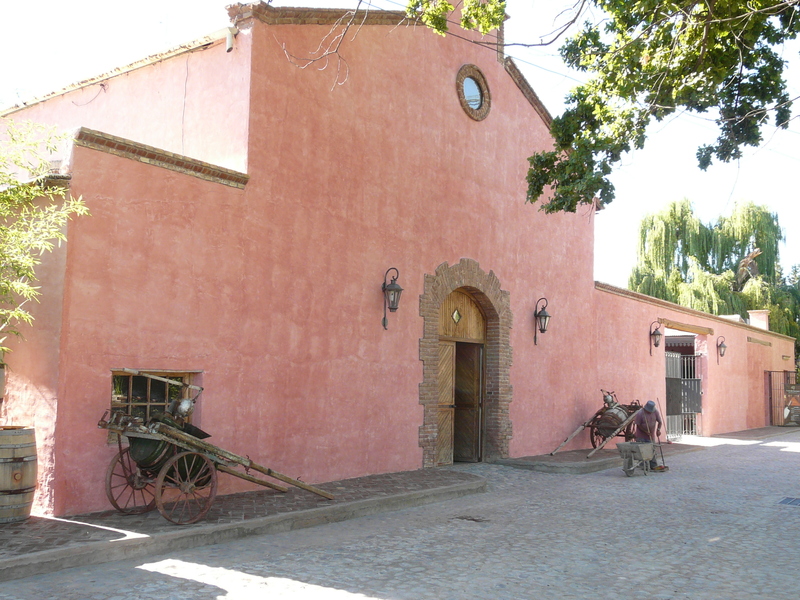 The four wineries were a great snapshot into the winemaking traditions of Mendoza, how the winemaking techniques have evolved over time and what the future direction of the winemaking in Mendoza. The Mendoza region is considered high-desert with sudden and very violent hail storms. The valley floor vineyards were nearly all covered in protective hail nets. Initially, I thought the netting was for protection from birds but our tour guide told us about the severity of the hail storms. The week before our visit, a large area about 300 KM south of the valley was hit by a very bad hail storm that wiped out the entire vintage in the area; after the hail stopped falling, there was baseball sized hail about two feet deep on the ground! Clos De Chacras is a very old winery (100 year+) which has been family owned for most of its existence. 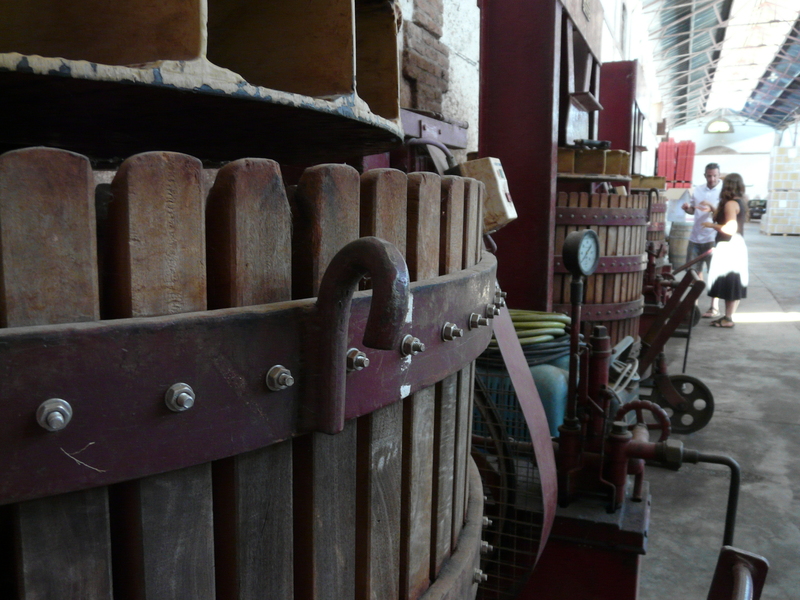 The winery did change hands once during the 1970’s economic problems in Argentina. The winery production is very small by Mendoza standards — about 6500 cases of wine per year. All the production techniques are similar to what is done at Crushpad with the exception of the use of concrete fermentation and storage tanks. The concrete tanks insides are covered with epoxy every two years to avoid cement and wine interactions. The oldest concrete tanks from the 1920’s have been converted into caves for bottle aging. The winemaker is a young man who recently graduated from one of the local winemaking schools in the valley. We tried three wines: 2005 Cavas De Crianza, Merlot ($8 USD or 24 pesos), 2005 Cavas De Crianza, Cabernet Sauvignon, Mendoza ($10 USD or 30 pesos), and 2005 Gran Estripe blend ($29 USD or 84 pesos). All three wines were quite good especially for the price point. The Gran Estripe I would say is an excellent wine. If you have a chance to try any of these wines, you really should. 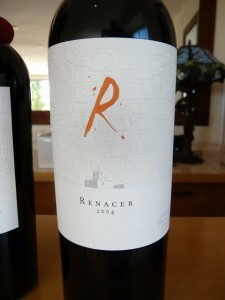 ReNacer is considered a small producer by Mendoza standards. The location is beautiful, great facilities and a lovely tasting room. The winery uses stainless steel tanks for fermentation (at the moment) and mostly french oak barrels. The winery is currently constructing a set of underground cement fermentation tanks to help control the fermentation temperatures and use the ground’s natural temperature to keep cooling energy costs down. The use of cement tanks is coming back into vogue in the Mendoza Valley. As part of our tasting experience, we got to do a blending experiment using Malbecs grown from three different regions in Mendoza: Ugarteche (700m altitude), Agrelo (990m altitude, clay and medium sized rocks in the soil), and La Consulta (1100m altitude, rocky soil, less hail due to proximity to the Andes). Ugarteche sourced malbec was pronounced perfumed with aromas of roses, coffee, plum, blackberry, and boysenberry, medium+ tannins, medium+ alcohol and flavors of coffee, boysenberry and raisin/fig. Agrelo sourced malbec was medium+ intensity on the nose, aromas of violets, rose, cedar, smokey red cherry, black fruit;slightly drying medium+ tannins with flavors of black cherry, black currant, smoke, cedar and a slight savoriness on the palate. La Consulta sourced malbec was medium+ intensity on the nose with aromas of rose, cherry and flavors of red cherry, slight cranberry, black cherry. The higher the altitude, the fresher the fruit flavors. For people who have not tried blending wine, I highly suggest it as it is an eye-opening experience. You realize that blending truely is an art . You must be patient, methodical in analysis of your components and each blend you try, take good notes and have an open mind to new blends. Wine chemistry is very sensative in how a slight change can drastically alter what you smell, taste and how the wine feels in your mouth. As a winemaker, I started off the blending session with 50% Agrelo, 30% Ugarteche and 20% La Consulta — I like it quite a bit which was surprising since it was the first attempt after tasting the components. Jen made an interesting blend of 75% La Consulta, 15% Ugarteche, 10% Agrelo; the blend would be great after 3 to 4 years of bottle aging and the fruit of the Agrelo did a lot to help make the tannins of the La Consulta more approachable. After the blending session was over, we did try three wines from ReNacer: 2007 Malbec, punto final Classico, Mendoza (32 pesos or $10 USD); 2006 Malbec punto final Reserva, Mendoza; 2007 Enamore, ReNacer+Allegrini, Mendoza ($40 USD). 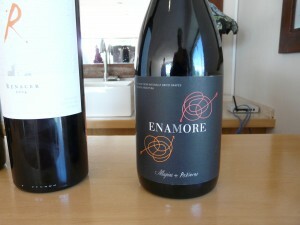 All the wines were very good especially the Enamore. Our third winery stop was combined with lunch. 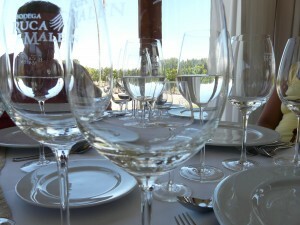 We had a fantastic 5 course lunch at Bodega Ruca Malen. Each course was paired with a wine from the winery. The wines we tried were 2007 Yauquen Chardonnay (21 pesos), 2007 Yauquen Malbec (21 pesos), 2007 Ruca Malen Petit Verdot (42 pesos), 2006 Ruca Malen Cabernet Sauvignon ($40 USD), and 2007 Kinien Malbec. The wines were very well paired with the food. We did get to try a local drink called Mate which is similar to tea but has a strong dried herb taste. The Petit Verdot was probably my favorite wine at the meal. The last winery we visited was Bodega Benegas. This is a recently renovated 100+ year old adobe winery. The winery has some very old estate vines — 75+ year old Sangiovese and 100+ year old Cabernet Franc vines. The new owner has put in $3 to $4MM USD into the renovation. The facility is quite impressive with a very nice cellar for barrel aging, converted old concrete fermentation/storage tanks into bottle storage for the 12 month bottling aging given to most of their red wines and a large crushpad area that includes a large number of “smallish” cement tanks used for fermentation. The cement tanks for fermentation can be heated using natural gas burners to heat the bottom of the tank. Old pneumatic basket presses are used instead of more modern equipment to get a gentle pressure on the skins. We tasted the following wines: 2007 Carmela Benegas, Rose of Cabernet Franc & Malbec (31 pesos), 2005 Sangiovese (65 pesos), 2005 Syrah (65 pesos), 2005 Meritage Blend (65 pesos), and 2005 Benegas Lynch, Libertad Vineyards, Cabernet Franc (140 pesos). The wines were all very good, well made and quite drinkable. The Rose was a bit too sweet for my personal tastes. 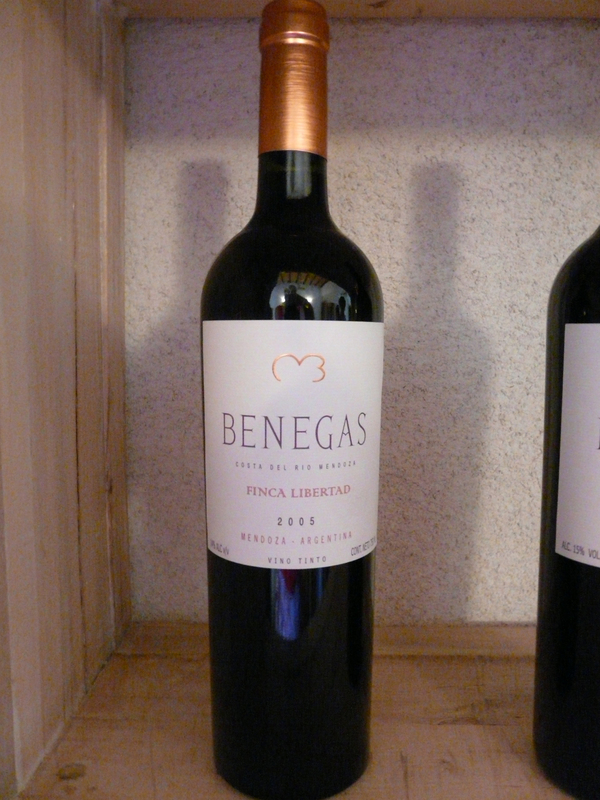 I would highly recommend seeking out Bodega Benegas as the quality of the wine is very good especially at the US price point. My take aways from the day’s tasting were the following: 1) US production costs are going to have to drop significantly if they want to be able to compete with Argentinian wines once the exports start flowing (only about 5% of Argentina production is currently exported), 2) wine quality in Mendoza is very good across the various price points from jug wine to ultra-premium, and 3) the marketing materials are very well-done. Overall, the US needs to take note of what is happening in Mendoza as the wines from there will be a force to be dealt with very soon! The wine is priced at 140 pesos at the winery. The 100+ year old vines are located by the Mendoza River on estate vineyards. Palate: high acidity; medium- fine grained tannins; medium+ length, medium- body; pronounced intensity; flavors of cherry(red and black), orange blossom, hint of marmalade, violets; medium alcohol. Quality: Excellent; drink well now but could hold for 5 to 7 years. The orange blossom and hint of marmalade is reminiscent of a Rutherglen Muscat which is very surprising but gives a hint of sweetness that surprisely combines very well with the other aromas and flavors. Jen and I purchased of bottle of this to have that evening with dinner. The wine was tremendous! I wish we had sent some home. The wine is 65 pesos at the winery. Palate: high acidity; medium+ fine-grained tannins; medium concentration; medium+ alcohol; medium+ length; flavors of pomegranite, dry cherry, mineryal, red cherry. Quality: good to excellent, drink now but could hold for 2 to 3 years. The wine is priced 65 pesos at the winery. The wine comes from 50 to 75 year old sangiovese vines located near the Luyan river. The wine was made in the brunello style of wine — they succeeded very well! Palate: medium+ acidity; medium (slight green tannins but not too strong) tannins; medium+ concentration; long length; flavors of dark cherry, baking spices, walnuts (with air). Quality: Good to excellent due to the complex and layered aromas/flavors, good concentration, length and good overall balance. You would hard pressed to know this came from Mendoza instead of Tuscany! The wine is priced 31 pesos. It is a rose of Cabernett Franc and Malbec. Palate: flavors of dried cherry; a bit too sweet for my taste. This wine is priced at $40 USD. 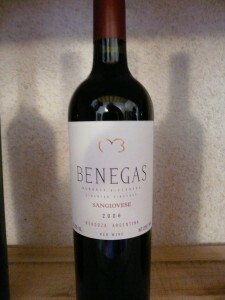 The wine is blend of Malbec (60%), Cabernet Franc (23%), Cabernet Sauvignon (10%), Syrah (4%) and Bonarda (3%). 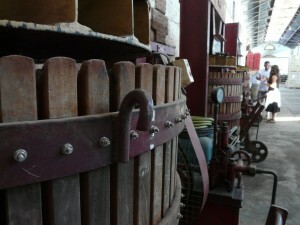 The grapes were dried and processed in the Amarone style — dried on trays before being crushed and fermented. The grapes were cold soaked for 10 days at 8 degree celsius and then fermented using native yeast for 90 days in stainless steel tanks at temperatures between 27 and 29 degrees C. The wine was aged in new French Oak barriques for 12 months. Palate: medium+ concentration; medium alcohol; long finish; flavors = berry compote, black berry, plum, slight savory element. The palate is very dense, balanced from start to finish. Quality: This is a very good wine and well worth seeking out. The wine will hold for many years and develop more complexity in the bottle. The wine is a blend of 40% Uco Valley fruit and 60% Agrelo fruit. The blend is Malbec (99%) and Cabernet Franc (1%). The grapes were cold soaked for 12 days at 8 C and fermented with native yeasts over 17 days in stainless steel tanks at temperatures between 27 C and 31 C. The wine as aged in French Oak barriques for 10 months. Palate: high acidity; medium+ to high alcohol; medium, slightly green tannins; Flavors that match the aromas. Note: green tannins picked up on finish. Quality: good but green tannins distract from the finish. © 2019 - The Grapevine is powered by WordPress.